Davey's Locker, located in the heart of Orange County, is one of the largest marine recreation centers in Southern California. Davey's Locker's marine recreation activities include sportfishing trips, whale watching tours, and festive holiday cruises. Davey's Locker has provided whale watching trips and deep sea fishing trips for over 40 years to Los Angeles, Long Beach, Orange County, and the Greater Inland Empire. Before you board the boat you may want to visit Davey's Locker's Tackle, our complete on-site tackle shop. We carry everything from fishing licenses, rental and purchase rods and reels and an assortment of other tackle to whale watching items such as binoculars, sun screen, and sunglasses to ensure that you can make the most of one of our sportfishing or whale watching outings. 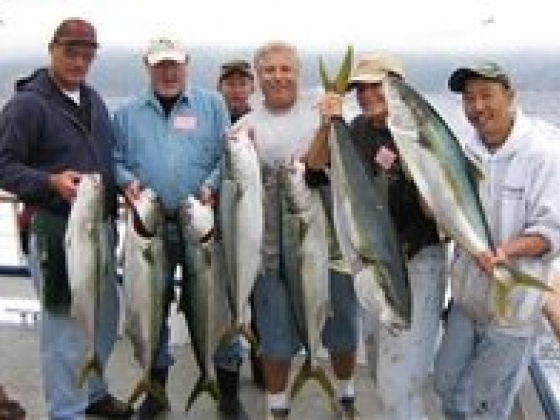 Newport Beach Private Fishing Charter (Boat Rentals) Daveys Locker Sportfishing offers Newport Beach fishing charter, fishing trips for yellowtail, white seabass, halibut Davey's Locker Sportfishing private charters are the perfect alternative to the annual golf tournament or company picnic. Our well maintained fleet of 6 ships has a boat to accommodate any size group up to 99 passengers. All of our boats feature a full galley and spacious deck space and the most sophisticated fish tracking systems available. Some of our boats even have passenger sleeping facilities on board making them perfect for overnight and multiple day excursions. Davey's Locker's Tackle Shop, our on-site tackle shop, has all the equipment, including rod and reel rental outfits, licenses, tackle, etc. available for your group's outing. Western Pride 1/2 day- 6:00AM to 12:00 PM or 12:30PM to 5:30PM. Price $40 Adults, $33 Junior/Senior Daily General Admission Trips 80ft. 90 Passenger Max. Fishing local coastal areas from Dana Point to Long Beach, Catalina Island and off-shore. Spacious and comfortable galley/snack bar with seating for 30. Ideal for large groups and company outings. Private Charters or boat rentals available (including special twilight $1100 boat rental good for weekdays and weekends year round). Freelance Daveys Locker Sportfishing offers Newport Beach fishing charter, fishing trips for yellowtail, white seabass, halibut 3/4 day- 7:00AM to 5:00 PM 7PM to 12:00 AM. Price $69 Adults, Junior/Senior $59 Daily General Admission Trips 80 Foot, 90 Passenger Maximum. Fishes Coastal Area, Catalina Island and Close Off-shore for Bass, Barracuda, Yellowtail and Tuna (in season). Operates Daily Twilight Fishing (evenings) April Thru September. Galley Seats 30 Private Charters or boat rentals available. Contact us for more information. Daveys Locker Sportfishing offers Newport Beach fishing charter, fishing trips for yellowtail, white seabass, halibutThunderbird Overnight Fishing - 9PM - 7AM 65ft. 48 Passengers Max. on local trips. Sleeps 22 passengers (includes some double bunks) for overnight and multiday trips. 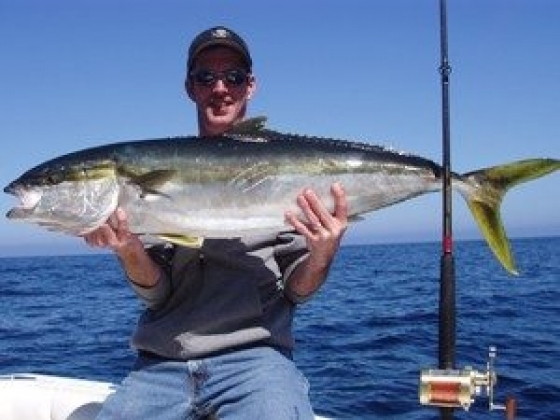 Fishing local coastal areas from Dana Point to Long Beach, and Catalina Island on local trips. Fishes San Clemente Island, Outer Banks, and Off-shore on overnight and multidays. Price Range: $119 - $159 Prvate shark charter or boat rental available. Contact us for more information. Daveys Locker Sportfishing offers Newport Beach fishing charter, fishing trips for yellowtail, white seabass, halibutBongos III & Tailchaser 6 Pac Boats 6 Pack Private Charters / Open Party 1/2 Day, Full Day, Overnight and Shark Fishing Trips. 2 Boats, Each 6 Passenger Maximum, 37 to 42ft. All boats 20+ Knots. Fishing local coastal areas from Dana Point to Long Beach, Catalina Island, San Clemente Island, and Off-shore For Tuna, Marlin, Yellowtail, Shark and Dorado. Rods, Reels and Tackle included (excludes fishing licenses).